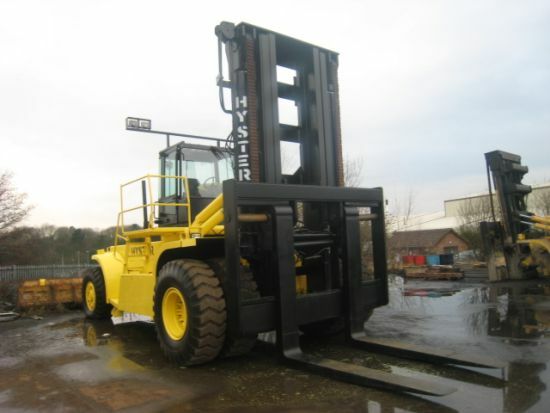 The series features the Hyster �Vista� cab and focuses on providing superior driver comfort, ergonomics and excellent all round visibility. The easily accessed operator compartment is ideally positioned for optimal visibility on the forks. Through-mast visibility is excellent and rearwards vision is greatly enhanced by the low profile shape of the new counterweight. Air-conditioning features as standard and in-cab noise level is comfortably low at 75dB(A) according to EN12053. The dash display is positioned to the driver�s right-hand side, to avoid unnecessary distraction, and maximise forward visibility. Operators can also choose between either a newly designed joystick control or conventional lever and switch controls. A powerful 6 cylinder, 10.8 litre Cummins QSM11 turbo diesel engine provides clean-running power, conforming to the EC Tier 3 emissions standards for Non-Road Mobile Machinery. For increased productivity and fuel economy, two engine performance levels are available, either with 224 kW or 272 kW @ 1800 rpm. The engine is combined with a four-speed powershift transmission, the �APC200 Soft-Shift� automatic gear shifting, protective forward / reverse shifting lock-out, a transmission protection system and a heavy-duty �AxleTech� drive-axle featuring wet disc brakes.